Pub in St John's Wood. 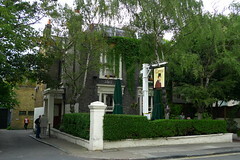 It closed after being sold in late 2013, and remained closed for some time, but according to the Aug/Sep 2017 London Drinker it reopened in May 2017. We haven't visited since it reopened, but our assessment of its previous incarnation can be seen on an older version of this page. Opening hours taken from the Clifton website, July 2017. Last edited 2017-07-28 15:33:40 (version 12; diff). List all versions. Page last edited 2017-07-28 15:33:40 (version 12).